Nothing fancy, I know, everybody's had mozzarella and tomatoes at least once in their life. Yet, I wanted to share with you the way we eat caprese these days - I served this at a cocktail party once, for which they are obviously perfect, but my family now prefers this neat, non-messy way of eating this Italian dish above all others. 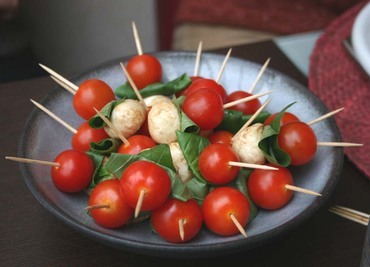 The principle is the same, little balls of mozzarella (bocconcini) on sticks (short bambo skewers or toothpicks) with rolled leaves of basil and cherry tomatoes. 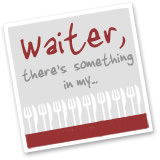 I marinate the cheese first, in some olive oil, black pepper and balsamico, it may not be authentic, but it sure tastes good! That looks like a really perfect way to serve that particular "salad"...I've always pondered the idea of serving something such as salad at a stand-up party...I may nick this for my next cocktail party. Thanks!